​The Volunteer Driver Program Toolkit, developed by ESCC, has a number of resources to assist your organization in driver management. The Volunteer Driver Checklist (found on page 10) is a useful guide for ensuring all the necessary components are in place for screening, hiring, and managing your drivers. In addition, the ESCC has developed several sample documents that can be adapted for use when screening, hiring, training, and evaluating new drivers. These templates can be found throughout this section. Compassionate and qualified drivers are essential to the success of your assisted transportation service. Outlining the necessary competencies and qualifications in your job or volunteer posting will ensure that the right candidates are applying for the position. Clearly articulated position requirements, including skills and qualifications, personal attributes and qualities are important so that drivers understand what is expected of them in this position. It also provides standards for the quality of service your clients receive. Your drivers can influence your clients’ and the community’s opinion about your organization, so it is important to articulate the position expectations and interview drivers to determine if they are the right fit. Recruiting and maintaining a pool of qualified volunteer drivers is essential to the success of any volunteer driver program. The ESCC Volunteer Driver Program Toolkit suggests using informal approaches to volunteer recruitment as they are cost effective and efficient. These approaches include using word-of-mouth, posting on your organization’s website, messages in your organization’s newsletter, registering with 211 Alberta, presentations to service clubs and community groups, social media, and information booths at local fairs. In Alberta, there are 26 Volunteer Centres which offer a variety of resources and support for both volunteers and non-profit organizations. Some Volunteer Centres offer the ability to post your organization’s volunteer opportunities. The Edmonton Chamber of Voluntary Organizations (ECVO) and Propellus of Calgary have partnered to expand their online tool which lists volunteer opportunities available in the province. Volunteer organizations are able to sign up and post their volunteer opportunities for free. If you are interested in posting your volunteer opportunities, contact Volunteer Connector by filling out this form. 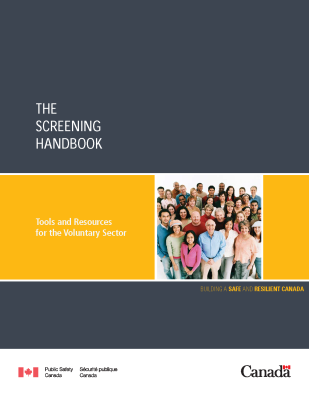 Volunteer Canada has put together a handbook, The Screening Handbook: Tools and Resources for the Voluntary Sector which contains “tools and resources to better match people and organizations, improve the safety and quality of programs in communities, and reduce risks and liabilities.” This document contains the 10 Steps of Screening which gives guidelines for developing screening policies and practices. Volunteer Alberta also contains numerous resources to help your organization screen volunteers. Resources include webinars, the Volunteer Screening Program, 10 Steps of Screening, and information on police information & vulnerable sector checks. Background checks are an important piece in the screening process and should be included as part of your organization’s risk management plan. Background checks can include reference checks, driver abstracts, proof of valid driver’s license, registration, and insurance, and police information and vulnerable sector checks. Standard Driver Abstracts are printed summaries of an individual’s driving record, including current status of the drivers licence, demerit points, convictions, and suspensions. Abstracts can be requested for the previous 3, 5, and 10 years. If you are in Alberta, driver abstracts can be obtained by filling out the Request for Personal Driving and Motor Vehicle Information and dropping it off in person at a registry agent. For more information, visit the Government of Alberta. When interpreting a driver abstract, it is important to understand the demerit point penalties in Alberta. The list of demerit point penalties is available on Alberta Transportation’s website. In addition, ThinkInsure provides an overview of Alberta’s Demerit Point System. An important consideration that your organization should discuss as part of your policies and procedures is whether you require a clean abstract (e.g., with no demerits or convictions) or whether your organization will allow a certain number of demerits dependent on the frequency, severity, and/or recency of such penalties. Police information and vulnerable sector checks are elements of screening and recruitment. However, they are not always necessary. Volunteer Alberta has put together resources to help guide your organization’s decision in identifying if, and when, it is necessary to seek Police Information and Vulnerable Sector Checks. If you are unsure as to whether these Checks are required, please consult your local police service. It is recommended that you provide the job description and its risk assessment. Volunteer Alberta: Is a Police Information Check the Only Way? Police Information Checks list all criminal convictions and all pending court appearances for both criminal and relevant statute offences, criminal convictions not recorded on a criminal record, relevant provincial statute convictions in addition to any court imposed orders. Vulnerable Sector Checks are requested as a part of a Police Information Check when a volunteer is solely responsible for the well-being of children under the age of 18, older adults over the age of 65, or people with a physical or mental disability. Vulnerable Sector Checks list non-conviction locally held police records demonstrating a pattern of behaviour that may result in harm to vulnerable persons. No Information to Disclose Certificate: Issued when the applicant does not have any criminal convictions, relevant provincial statute convictions, outstanding criminal or relevant provincial statute charges or local police records representing a pattern of behaviour that may result in harm to vulnerable persons. These results are only shared with the requesting organization if the applicant has signed a Third Party Consent Form. Information to Disclose Certificate: Issued when criminal convictions, relevant provincial statute convictions, outstanding criminal or relevant provincial statute charges or local police records representing a pattern of behaviour that may result in harm to vulnerable persons exists. These results will only be released to the applicant and will never be shared with a third party. Results of any local police records not resulting in the laying of criminal charges will be clearly articulated. ​Once you have selected and hired the right candidates for your assisted transportation service, it is important they receive the appropriate orientation and training to ensure not only their success in their role but for client satisfaction as well. In addition, both driver orientation and driver training are important pieces in your organization’s Risk Management plan. Driver orientation introduces new drivers to the fundamentals of the position, allowing them to understand their role, your organization’s culture, and the policies and procedures that need to be followed. Orientation can include sharing your organization’s background, a tour of your organization’s programs and services, and your organization’s policy manual. In addition, orientation can include having drivers complete a Statement of Understanding, a Code of Ethics, and an Oath of Confidentiality. Senior Sensitivity Training: This type of training is designed to help your drivers better understand the needs of seniors as there are changes in sensory, motor, and cognitive abilities that occur with age that may require certain accommodations. The Alberta Council on Aging has more information about senior sensitivity training as part of their Senior Friendly Program. In addition, there are kits that can be purchased for your organization’s senior sensitivity training. Lee Health has developed Aging Sensitivity Training which include a DVD and CDs that walk you through the program, a virtual training manual, handouts, and items to help simulate some of the age-related changes that seniors may experience. Ongoing supervision and evaluation are also important in ensuring your drivers’ continued success and appropriate conduct within your organization. Regular evaluation ensures drivers continue to be a good match for the role and offers opportunities to provide feedback, support, and recognition. There are several ways to evaluate your drivers including scheduling regular performance evaluations, providing opportunities for peer feedback, and doing client satisfaction surveys.